Did you know 1 in 8 babies are born prematurely? More than half a million babies are born prematurely in the United States each year. Premature birth is the #1 cause of death during the first month of life. The mission of the March of Dimes is to improve the health of babies by preventing birth defects, premature birth, and infant mortality. Since 1978, Key Clubs have spread awareness and donated millions of dollars toward this great cause. Key Club members, like you, can support the March of Dimes each semester: in the fall, raise awareness by hosting programs throughout November for Prematurity Awareness Month and in the spring, raise funds by participating in March for Babies, the March of Dimes largest annual fundraiser. Throughout November, Key Club members can support the March of Dimes mission by educating peers on the importance of healthy lifestyles through volunteering and advocacy. From volunteering at a Neonatal Intensive Care Unit in a local hospital by making scrapbook pages or hosting a dinner for the parents, to making it a priority to spread awareness the whole month through the usage of social media such as Facebook status and tweets, you can make a difference! On Global Prematurity Day, November 17, you can do a range of activities to spread awareness about the global problem of preterm birth! Your club can host an event at your school to educate others and you can dedicate a day to wear purple, the March of Dimes color. An excellent way to support the March of Dimes is by participating in our largest annual fundraiser, March for Babies. 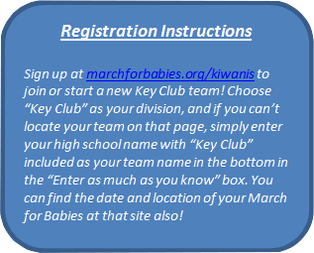 There are tons of fun ways to get involved with March for Babies. Your club can host coin collections, dances, and in-school challenges to raise funds. Then join with your community in March for Babies to walk to give every baby a healthy start. Copyright 2014-2019 Wisconsin - Upper Michigan District of Key Club. All Rights Reserved.